Bringing back Darren Sproles can be defended to some degree, but the degree to which the team appears to have been counting on him cannot. The 2018 Philadelphia Eagles season has not been good. #Analysis. Players have gotten injured and/or under-performed, the coaching staff doesn't have the same magic that it did a year ago, and front office moves made prior to the season have not panned out the way they did in 2017. • Released Brent Celek: For what Celek was providing on the field vs. the money he was making, it was a no-brainer to release the long-time Eagle. Second-round draft pick Dallas Goedert has been a clear upgrade over Celek, though Celek's veteran presence (or lack thereof this season) is hard to quantify. • Agreed to terms on a five-year contract with Nigel Bradham: The Eagles locked up Bradham to a team-friendly deal, thus quelling concerns of a perceived lack of depth at the position during the offseason, though Bradham has probably had his quietest season so far since he's been with the team. • Acquired DE Michael Bennett and a seventh-round pick in the 2018 NFL Draft from the Seattle Seahawks in exchange for a fifth-round selection in 2018 and WR Marcus Johnson: Bennett has clearly been the best defensive end on the team this season, and was absolutely worth trading for. • Traded WR Torrey Smith to the Carolina Panthers in exchange for CB Daryl Worley: The team was going to cut Smith anyway, so trading him for a young corner with starting experience seemed at the time like a coup. However, Worley was arrested a month later, and subsequently released by the team. Smith has 16 catches for 171 yards and 2 TDs in Carolina this season. • Agreed to terms on a one-year contract with LB Corey Nelson: Nelson stunk during training camp and never made the 53-man roster. He cost the team $600,000 in dead money when they released him. The Eagles are lucky that Kamu Grugier-Hill has stepped up and ably manned the WILL linebacker spot. • Signed DT Haloti Ngata to a one-year contract: At 34 years of ages (he'll turn 35 in January), Ngata looks cooked. The Eagles did not adequately replace Beau Allen's contributions. • Released DE Vinny Curry: Like the Celek release, this was a no-brainer based on production vs. pay. • Agreed to terms with WR Mike Wallace on a one-year contract: There was a solid argument to be made at the time of this signing that Wallace would be an upgrade on Smith. Unfortunately, Wallace broke his fibula Week 2 vs. the Bucs, and has not played since. Wallace does not have any catches in his short Eagles career, though he did get open a few times with Nick Foles being unable to get him the football. To be determined if Wallace will get a chance to play with Carson Wentz. He is eligible to come off of injured reserve after this week's matchup against the Saints. • Released Mychal Kendricks: As noted above, Grugier-Hill has played well, and Kendricks was suspended after pleading guilty to insider trading charges. • Agreed to terms with LB Paul Worrilow on a one-year contract: Worrilow tore his ACL during OTAs. • Agreed to terms with TE Richard Rodgers on a one-year contract: Rodgers had a good camp and preseason, but he injured his knee and missed the first nine games of the season. He was reactivated from injured reserve this week. 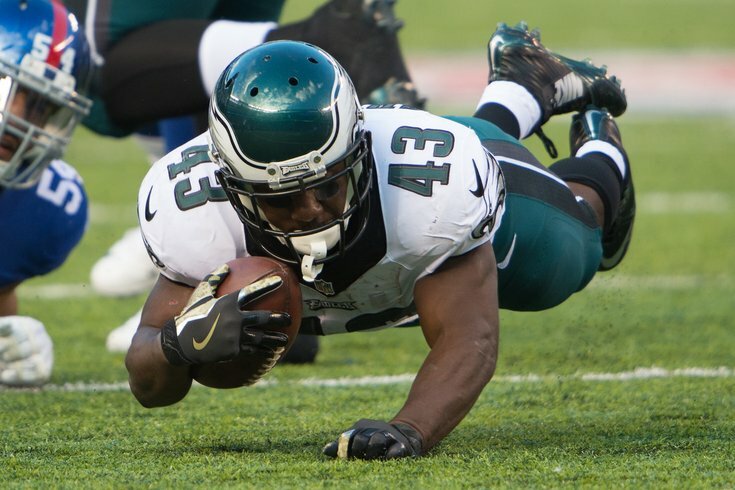 • Agreed to terms with RB Darren Sproles on a one-year deal: After the 2018 NFL Draft came and went with the Eagles not selecting a running back with any of their five picks, the Eagles turned to a 35-year-old Sproles, who was coming back from an ACL tear. Depending on such a player has proven to be an ill-advised move. • Re-signed S Corey Graham to a one-year contract: Graham was a nice contributor in 2017, but it appears that he has played one year too many. • Not listed above are the players who walked in free agency, including Patrick Robinson, Beau Allen, Trey Burton, and LeGarrette Blount. Those players would have been very difficult for the salary cap-deficient Eagles to afford (especially Burton), and it's worth noting that the team is in line to receive three compensatory picks for those free agent losses. • Also not noted above is the fact that the team opted not to trade Nick Foles. According to Michael Silver of NFL.com, the Eagles had in their hands an offer for the 35th overall pick in the 2018 NFL Draft, which they turned down. In hindsight, if indeed that offer was made, that is a deal that the Eagles obviously should have taken, as (A) Foles did not play well before giving way to Carson Wentz, and (B) there are a whole slew of players taken in the first 15 or so picks of the second-round of that draft who are playing well as rookies.